In 1911, the Belgian colonial administration unilaterally awarded Lord Leverhulme of Britain a massive one-million-hectare land concession covering the territories of these communities and many others. Leverhulme, with the support of the Belgian army, used forced labour and violent repression to extract palm oil from the forests for his Sunlight soap factories in the UK and eventually erected several oil palm plantations within the concession area that would come to be owned and operated by the multinational food giant Unilever. In 2009, Unilever sold its DRC oil palm plantation subsidiary, Plantations et Huileries du Congo (PHC), along with a set of contested concession contracts totalling over 100,000 hectares, to a Canadian company with no previous experience with plantations– Feronia Inc. The nine communities filed their complaint with the DEG’s complaints mechanism on Monday, November 5, 2018. They say that the illegal theft of their traditional lands and forests has deprived them of the means to feed and house their families and earn their livelihoods. Some of the people from the communities work on the plantations, but the vast majority of jobs are as day labourers where wages are below the costs of living. Poverty and malnutrition within the communities are rampant and severe, and the communities say that conditions have worsened since Feronia took over the plantations from Unilever. The nine communities have filed this complaint with the DEG’s complaints mechanism in the hopes that the consortium of lenders led by DEG, will finally force the company into a dispute resolution and mediation process with the communities that resolves the land conflict by defining the area of land on which PHC can operate and the conditions under which it may do so. 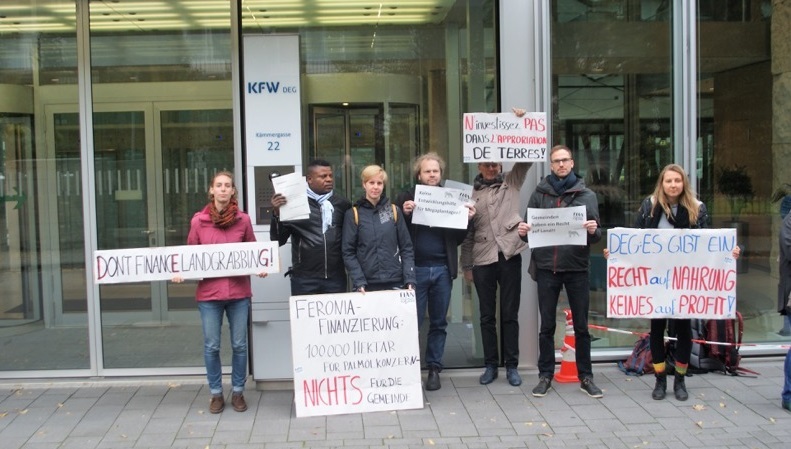 All development banks have justified their investment in Feronia or PHC with their mandate to support development in Africa, which, in this case, cannot be achieved without a resolution of the land conflict. RIAO-RDC and its international partners want to see a fair and urgent resolution of this land conflict. This is a test case to see if the complaints mechanisms established by the development banks can indeed address the concerns raised by communities affected by the agribusiness operations of companies financed by the DEG and other development banks. It will also set a precedent when it comes to legacy land issues. The DEG and the UK’s CDC, which is more heavily invested in Feronia than any other development bank, recently established a policy to guide how their clients should deal with such legacy land issues. We will be watching closely to see if this policy is more than just words. * The complaints mechanism is a joint initiative of the DEG and the Dutch development bank FMO. Since July 2018, the French Development Finance Institution Proparco has also joined the Mechanism. All have provided funding to Feronia Inc’s DRC plantation operations.